With invasive pythons multiplying in the Florida Everglades, maybe it's time to start eating them. Here's a cajun grits and python recipe that will work well with any type of snake meat. Since Florida is now actively recruiting hunters to help rid the state and its Everglades of the invasive python, Scott Leysath, also known as The Sporting Chef, teams up with Shawn Meiman. Together, they offer up a Cajun-style python and grits recipe that can work well with any type of snake meat. Once the dish is done, Leysath samples the entree, noting the neutral flavor of the python, though it's on the chewy side. "Maybe tenderize it," he says, "or run it through a cuber like you would do with gator." Note: To check recipe details and learn how to skin and clean the snake, watch the video. 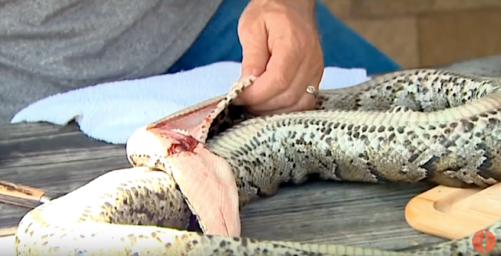 When skinning and deboning the python, stay out of the belly area. Otherwise you might find a decomposed rat or other prey, usually small game — though pythons in the Everglades have devoured whitetail deer and even an alligator. The snake's backstrap is in between the top of the vertebra and the rib cage so there's two strips, one on each side. Marinate the python meat in seafood marinade. Sprinkle with Cajun seasoning and sauté in butter. While that’s going, boil your water for the grits. When grits are ready, add salt, pepper, chopped yellow onions, chopped green onions, sausage and shredded cheese. Mix it all up and you’re done. What's Influenced Most by an Animal's Age: Meat Tenderness or Flavor?